Heat Oil in a large pan. Place cubed chicken on medium heat together with sliced Spring Onions and Peas until browned. 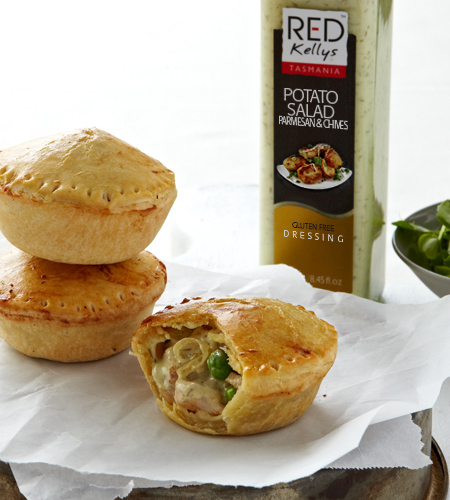 Stir in 125ml of Red Kellys Parmesan & Chive dressing and set aside in large bowl. Preheat Oven to 180°C. Grease a 12 hole medium (1/3 cups) muffin tin. Use cutters or a saucer as a guide to cut 3 x 6cm rounds from each sheet of pastry. Gently ease larger rounds into muffin holes. Fill pastry with chicken mixture, lay a smaller round of pastry on top and pinch edges with fork to seal. Bake for 30-40 mins until golden brown. Leave in muffin tin for 10 minutes then carefully lift out.